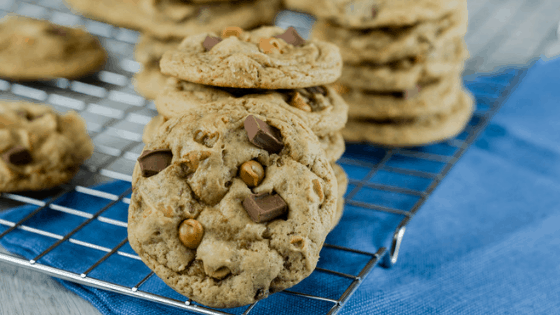 Soft and chewy peanut butter cookies made with chocolate chunks and peanut butter chips. This cookie batter creates a cookie that you sink your teeth into and feel the familiar texture of smooth and creamy peanut butter. The trick to achieving this texture is to not overbake these cookies in the oven. However, if you want your cookies to have a little crunch to them, then simply bake them longer in the oven. Making these creamy peanut butter cookies is quite simple. I use my hand mixer to mix this batter because it creams the wet ingredients together better than using just a spoon. I then add in 1 egg at a time, beating the mixture until the eggs are well combined. After that, I add in the vanilla. In a separate bowl, I blend together the salt, baking soda, and the flour. I make sure that it’s stirred well and then I slowly beat it into the wet ingredients. Once the cookie dough is combined, I gently stir in the chocolate chunks and the peanut butter chips. I drop the cookies by cookie scoop onto my baking sheets that are covered with silicone mats. You can also drop the cookies by rounded teaspoonfuls. I bake these cookies for about 9 minutes and the cookies come out chewy. You can bake these cookies longer if you want them to be more firm and have some crunch. I allow my cookies to cool for about 5 minutes before transferring them by spatula onto wired racks to cool completely. They will firm after they are completely cool but they will still have a creamy texture! Using a hand mixer, beat together the softened butter, peanut butter, brown sugar, and granulated sugar. Add in 1 egg at a time and beat. In a large bowl, blend together the flour, salt, and baking soda. Slowly beat the dry ingredients into the wet ingredients. Stir in the 1 cup of chocolate chunks and the 1 cup of peanut butter chips. Drop by cookie scoop onto a cookie sheet and bake for about 9-10 minutes. Let cool for 10 minutes before moving to wire rack to cool completely. Drooling over those pictures! Delicious!